Texas Freckles: I'm so excited! I noticed that Nova spilled the beans on her blog and Chrissie has a link on her blog, so I guess it's safe to share some news that has me very excited! I got to be a part of it! 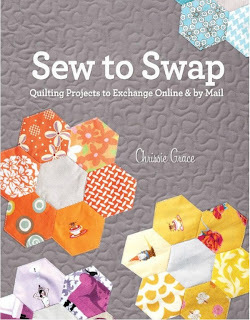 Last year, the lovely Chrissie Grace herself asked if I would be interested in contributing to a book she was writing about quilt swaps. Have you seen Chrissie's other books? Yes, I was interested! I was in some very good company too. It still doesn't feel real to have participated in something like this with Chrissie and some of the coolest bloggers out there. I'm sure I'll be mentioning this lovely book again soon, but I just wanted to share since I am so excited. Congratulations! That would be very exciting to be published and all... whooooohoooo! It will be oh so wonderful to hear more about it. It's so beautiful...I can't wait until you see it in person! yay! congrats to you, you are so very talented! Melanie, that is awesome! A big congrats to you. I can't wait to see that book. That is exciting!! Congrats & I can't wait to check out your contribution. Congratulations super talented friend! Can't wait to obtain that book...maybe you'll sign it for me?! Love that orange hexie flower! It looks like a great book-- can't wait to see more after the official publication date. How exciting that your orange hexie is on the cover-- it's beautiful! Congrats on being part of such an exciting project! How fun and exciting!!! I book I'm sure to enjoy :) Congratulations! Congrats on the book. It sounds like a great book...and there is definitely a market out there for it! Not sure if my last one went through so... Awesome and MORE awesome that your creation is on the cover! Exciting! I've added it to my amazon wishlist. I can't wait to get my copy either and to see it all in person! Congratulations! I can't wait to get a look at the book-probably one I'll need to have on my shelf. I love the quilt in your previous post. Wow! Congrats....cute blog. Fat Quarter shop...count me in (G)!!!! How much fun to be part of the book. Congrats!